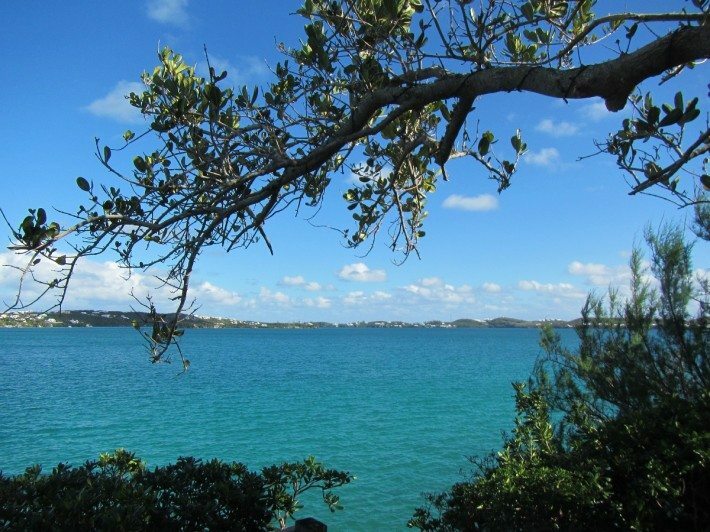 The Beautiful view of Harrington Sound from the Bermuda Aquarium and Zoo. 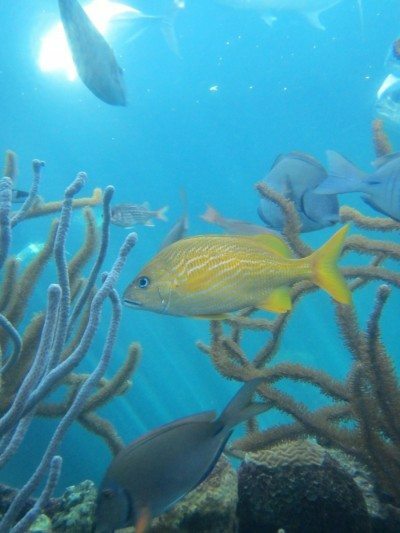 Located in Flatts, in Smiths Parish, the Bermuda Aquarium and Zoo was walking distance from our vacation rental. It is a very small place but rich in experience. Even though parts of the aquarium were closed due to damage caused by hurricanes Fay and Gonzalo, we still enjoyed ourselves and even went for a second visit. On our first visit, we purchased our tickets for the Friday Boat tour with the Audubon Society to go see the Bermuda Cahows, and endangered bird species making a comeback. We got to go into Joanne’s office, where she took our reservation information and then she came downstairs with us to get a second map. I told her about our own aquarium at home and our pond and creatures while standing in front of the North Rock Exhibit which consists of huge tanks with fish and creatures that inhabit North Rock off the coast of Bermuda. 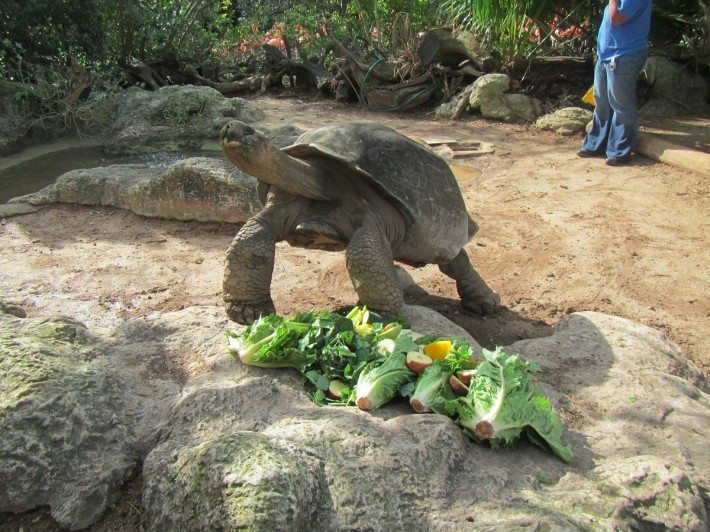 A 96 year old Galapagos tortoise at the Bermuda zoo eating his lunch with appetite. We started our visit counter clockwise. We nearly had the place to ourselves and were enjoying the beautiful views of Harrington Sounds across the tree branches. We took our time, taking the sun in and enjoying the sound of the waves crashing and of the birds singing. We arrived early enough to see the animals eating. It was great to see the Galapagos tortoises enjoying their huge salad of whole romaine lettuce, cucumbers, celery and other vegetables and fruits. In the Islands of The Caribbean section, we were charmed by the Lion Tamarin that was so funny and cute. The Cattle egret was not shy and all over the zoo keeper who was trying to get all the animals fed. 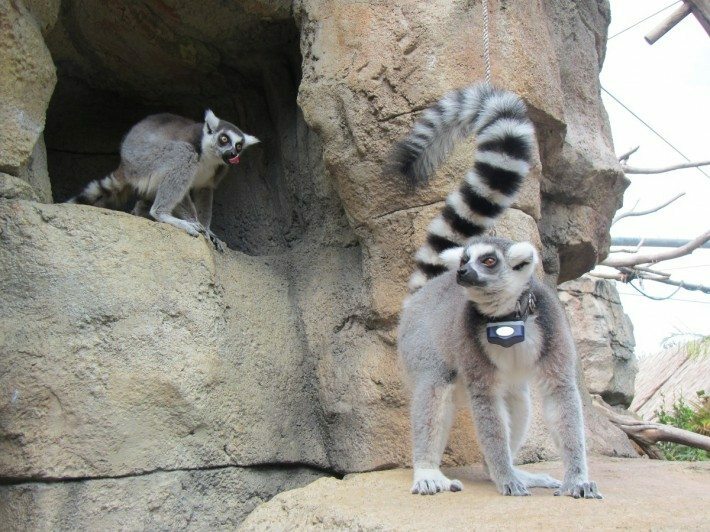 In the Island of Madagascar section we had a private encounter with the lemurs Elmer and Penelope! Although I don’t remember which one is which? We never thought we’d ever get to walk among lemurs in our life and that was a pleasant surprise. It brought to life the IMAX movie we had seen in Victoria, BC last summer. At the gift shop, they told us the story of the lemurs and why one wears a collar: it kept bugging the fossa, the main lemur predator in Madagascar, by putting its hands through the fence and the poor lemur was discovered one morning with tendons coming out of its arm, the fossa had grabbed him and it turned ugly. The other one had a broken back for which ever reason I forgot. But the lemur with the collar could understand I had noticed his or her friend’s disability. We wouldn’t see the fossa on the first visit but had a real wild encounter on our second visit, when one of the college volunteers told us she would be fed at 1:00. It was 11:30 but we thought it would be worth the wait and so we went back and did another tour of the zoo, taking our time, having a snack and visiting the Natural History Museum for a second time. 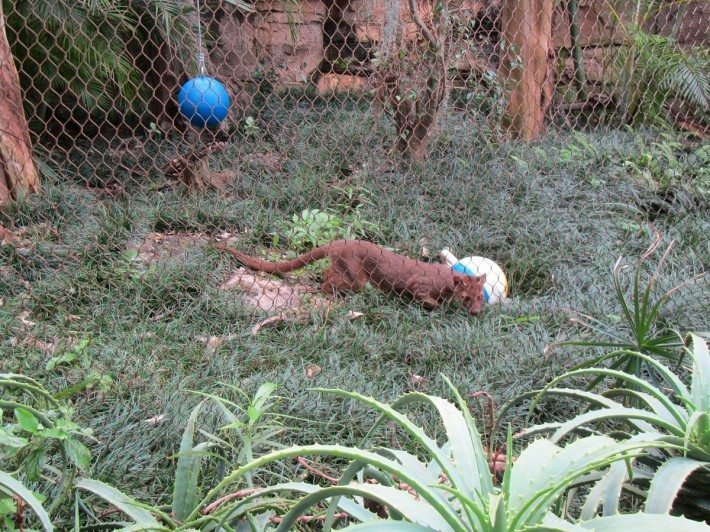 We went back in front of the fossa’s cage waiting for an employee or volunteer to show up but nobody came. I went out in search of somebody wondering if they were maybe late and then saw Mary, one of head volunteers and she brought us behind the scenes and introduced me to Eric who told me there was no such feeding during the day, and that the fossa was being fed the very first thing in the morning, before the zoo even opened. To make up for the volunteer who misguided us, he set out to place little bits of protein supplements around the cage. Mary said we were very fortunate to see this as this Fossa prefers living at night and not many visitors had the chance to see her. There was going to be an overbooked tour of the zoo at night that we tried to take part of with no chance, and apparently they wouldn’t even be able to see her as well as we did with their flashlights. The fossa entertained us for a good 40 minutes and then, inspired by her hunting our stomachs started to growl so it was time to go back to our cottage for a late lunch. 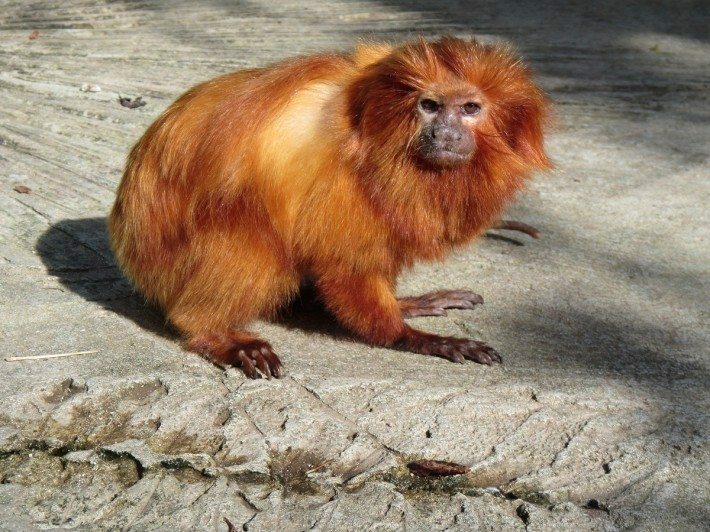 The Lion Tamarin in the Islands of the Caribbeans section of the Bermuda Zoo. 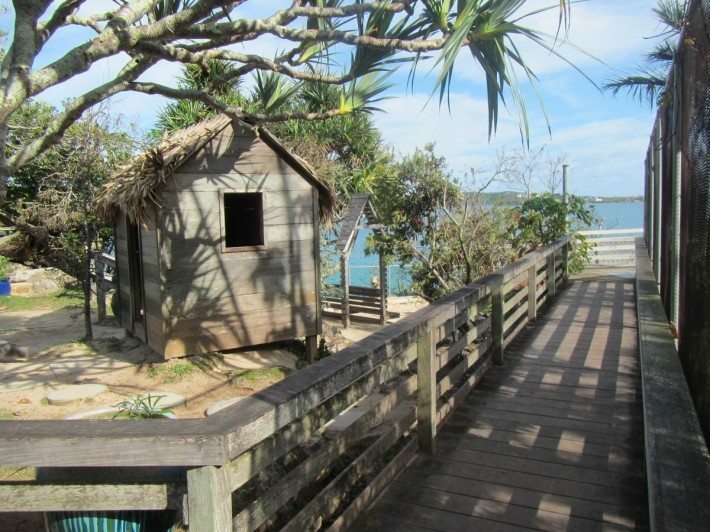 The boardwalk with lovely views at the Bermuda zoo.